The perfect way to explore the west coast of Scotland is from the sea on the Majestic Line's unique small-ship cruises. Journey through Scotland's western waterways to beautiful remote sea lochs and the islands of the Inner and Outer Hebrides. Each island has its own individual character, from white shell-sand beaches to rugged rocky shorelines, while the mainland coast is dotted with sea lochs, backed by forests and massive mountain ranges. But be warned, exploring the Hebrides is addictive and, like many of the Majestic Line's guests, you will want to return for more amazing voyages. The Majestic Line's food gets rave reviews from its guests. Every day, a delicious menu is created by your onboard Chef from the best of local, seasonal produce with special diets catered for. Seafood and fish are sourced from the clear waters of the sea lochs and wild venison, beef and lamb from the hills. The delicatessen delights for which Scotland is famous will also appear on your plate. Each meal is served at a different anchorage with a backdrop of a beautiful Hebridean coastline providing an unforgettable setting. The Majestic Line's three vessels are custom-designed for voyages to the Inner and Outer Hebrides. The Glen Massan and Glen Tarsan are charming conversions of traditional fishing boats with sturdy wooden hulls. 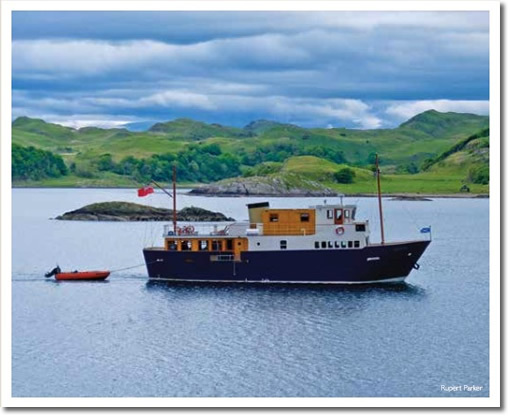 The Majestic Line's new vessel, the Glen Etive was custom-built on the Clyde with a steel hull in the same traditional style, and with additional features for longer voyages to more open waters. All three vessels have high quality brass and hardwood finishes. The accommodation on board is designed for maximum enjoyment and relaxation while at sea, with ensuite cabins, panoramic views from the dining deck saloon and the three outdoor decks. The Glen Massan and Glen Tarsan accommodate 11 guests in 6 double ensuite cabins. Cruises are 6-nights duration with a choice of 7 itineraries sailing the more sheltered waters of the Islands of the Inner and Southern Hebrides and the shores of Argyll, Ardnamurchan and Morvern. A 3-night cruise is very popular on these vessels for those short of time or who wish to test their sea legs for the rst time. The Glen Etive was specially designed to explore the more far-flung areas of the Western Isles, offering 10-night cruises to reach the Outer Hebrides and St Kilda, with more open water cruising. A 6-night cruise to Skye and the Small Isles is also available in April and October. The Glen Etive carries 12 guests in 7 double ensuite cabins. People who ordered Scotland West Coast Cruises also ordered the free travel brochures below. Click on the images to find out more about these brochures.